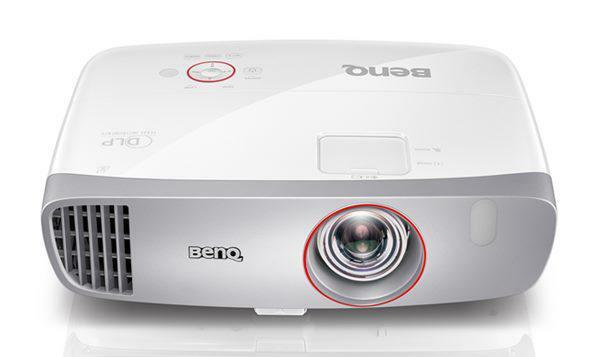 Until ViewSonic's new PJD7820HD, there was only one full HD projector at 3,000 lumens with a price tag under $800. And as an added attraction, the PJD7820HD beats its competition with a 3-year warranty. This price/performance combination is perfect for the home video category where Saturday afternoon movies and Sunday sports on a large screen are the order of the day even with ambient light in the room. Those 3,000 lumens will keep image washout to a minimum, and the resolution is high enough to count the blades of grass on the putting green close-ups. Another plus is the size of the PJD7820HD. Home video projectors can take up a fair amount of space, but with a sheet-of-paper footprint of only 10 ½" x 8 ¾", the PJD7820HD fits on a coffee table with ease. Since it throws a 100" diagonal image at a projection distance of a little over 8', you won't have to rearrange the whole living room to get a big picture. However, be aware that the PJD7820's 2-watt speaker may not be sufficient for a noisy weekend crowd. Other than that, this is a prime contender for the home video market, and an inexpensive one at that. The PJD7820HD is easy to set up out of the box with connectors clearly marked and control functions on both the projector and the remote that are easy to recognize. The icons on the remote are especially well done with high contrast buttons and unmistakable functionality. Warm-up only takes a minute or so, and with automatic search enabled, it is quick and easy to get an image on the screen. Just push the Source key or select a specific input from the separate keys at the top of the remote. This is a home video projector, and while it does a good job of displaying computer images crisply and evenly, it really shines when connected to a Blu-ray player or HDTV broadcast. Its brightness uniformity of 67% may be detectable on a black-and white spreadsheet, but it is much less noticeable when viewing video material. Highlights and shadows are rendered well thanks to a 15,000:1 contrast ratio. Colors are well saturated, and you have total control over image color settings as long as you use one of the two User Modes. If you do not want to fiddle with color gain and offset controls, simply use one of the Preset Modes to get flesh tones that are right on the mark. The best preset mode for viewing movies is ViewMatch. If room brightness allows it, add to the viewing experience by turning off Brilliant Color, which reduces highlight brightness and gives the image a more balanced appearance. Switch to one of the User modes, choose ViewMatch as the reference mode, and switch Brilliant Color "off" in the Picture menu. While brightness is reduced by about 50%, you will find that flesh tones are more realistic than with Brilliant Color turned on. The PJD7820HD has a six-segment RGBCYW color wheel, so if you are sensitive to rainbow artifacts, you may see them on the PJD7820HD. Since you have the option of enabling or disabling TI's Brilliant Color control, experiment with both settings to see which one you prefer. Brilliant Color provides emphasis on mid-tones and gives the image more pop, but switching it off gives the image a distinctly softer look with more depth and can help reduce the appearance of rainbows. Of course, image brightness is reduced, but it is still sufficient for all but the sunniest rooms. What about the lumens in 3d mode? You nice folks at ProjectorCentral measure it for other projectors. I would love your technical comparison against the Optoma HD25/LV. Can this projector PJD7820HD hang from the ceiling upside down and ready for ceiling mount? Have reversing capability. 24Hz X 3 Times (Triple Flash) = 72Hz/Per Eye = 144Hz Total Refresh Rate. - The Acer H6510BD is as follows - 24Hz X 2 Times (Normal double Flash) = 48Hz/Per Eye = 96Hz Total Refresh Rate. This is how I figured it out. Seems that 144Hz only matters for 24hz 3D-Blueray Movies.